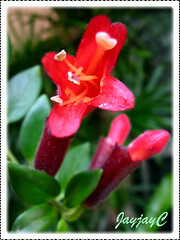 Features: Aeschynanthus radicans is one of 185 species in the genus Aeschynanthus, a member of the Gesneriad family with about 160 genera and an estimated 3,240 species. In the wild, this species grows as a trailing epiphyte on branches of trees in the tropical rainforests. In cultivation, it is popularly grown for its ornamental beauty in hanging baskets/pots, displaying long pendulous stems with dark green foliage and crowned with clusters of exotic flowers and buds in brilliant contrast. The cascading stems will grow to 90 cm in length or more if untrimmed, with opposite or whorled leaves that are small, ovate to lanceolate, up to 5 cm long, colored dark green and are thick, succulent and waxy. Clusters of 5-7.5 cm long tubular-shaped flowers (corolla), usually colored scarlet to crimson-red or bright red and held in dark maroon or green tubular calyxes are borne upright at terminal stems. 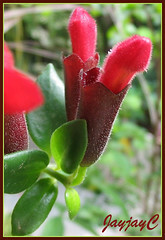 Lipstick Plant blooms intermittently through the year. It is the brilliant red buds growing out of these fairly large calyxes, resembling colored lipsticks emerging from their tubes that led to the common name, Lipstick Plant. 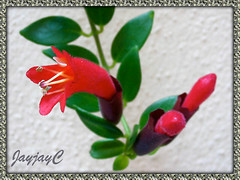 Thus, it is this variable species, Aeschynanthus radicans, that the common name aptly describes, though that name has been commonly applied to all Aeschynanthus even though some do not bear any resemblance. This plant can also be grown on mossy rocks like a lithophyte or trained as a vine-like climber on fences, trellis or wire frame by tying manually for support. 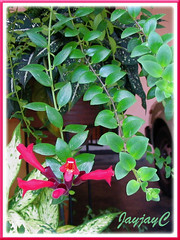 Culture (Care): Aeschynanthus radicans grows with ease outdoors or as a houseplant indoors as it is tolerant of conditions in the home. Light: Bright indirect sunlight to partial shade. It requires plenty of light (though not direct sunlight as its leaves scorch easily), warmth and humidity to promote flowering. Insufficient light inhibits flowering. Moisture: Water regularly and allow soil to dry out slightly between waterings. Water sparingly in cooler conditions. It is quite tolerant of drought once established. Soil: Evenly moist, fertile and well-drained soil. Light sandy soil with a mix of peat/humus is preferred. Others: Prune regularly after flowering to make plant fuller, encouraging new growth and flowering. It can take hard pruning, so trim leggy stems back to less than 10 cm above the soil for an eventual fuller and prettier display. Color of leaves can get tarnished with prolonged exposure to bright sunlight, so relocate if necessary. Being pot bound encourages it to flower. Repot every 2-3 years when pot is full of roots to rejuvenate growth. Feed fortnightly with a flowering houseplant fertilizer. No serious pests or diseases, though occasionally bothered by mealy bugs, white flies and aphids. For subtropical regions: Hardiness: USDA Zone 10 to higher. Water sparingly in winter and keep ideal temperatures above 60 degrees at night but 10-20 degrees higher during the day. Feed with a flowering houseplant fertilizer every two weeks in summer and monthly during winter. More at Michigan State Univ. Extension page. Propagation: Easily propagated from stem cuttings with bottom heat. Best to take 12 cm-long tip cuttings from healthy, non-flowering shoots, cutting just below the leaf joint in spring or early summer. Remove the lower leaves, leaving behind 6 top leaves and plant 3-4 cuttings in a shallow 5-inch pot. Place the pot in a bright, warm location and wet the soil regularly to stimulate growth. Alternatively, it can be propagated by simple layering. This technique basically consists of just bending a stem down and burying a section of its length into the soil and allowing roots to form on the buried part. Keep the stem well watered until rooted and sever from the parent plant for transplant. Usage: Ideal as houseplants and for a conservatory or greenhouse. Perfect for hanging baskets/pots to best display their lovely cascading stems and attractive flowers or in containers placed on a pedestal or windowsill. A vine-like plant that can be trained as a climber on fences and wire-frames or grown on ground or allowed to creep on mossy rock surfaces. Point to note: Aeschynanthus radicans is now the correct botanical name for A. lobbianus (as popularly known in North America) and A. javanicus.